The reigning Women’s Challenge Cup holders Rocasa Gran Canaria ACE will meet Slovenia's ZRK Mlinotest Ajdovscina in this season's Last 16 after the draw at the EHF Office in Vienna determined all eight pairings of the next stage. 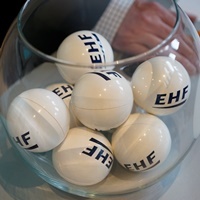 Markus Glaser, EHF Competitions Senior Manager together with Klaudija Bubalo from HC Lokomotiva Zagreb carried out the draw. Gran Canaria's domestic rivals from the Spanish league Mecalia Atletico Guardes take on Colegio de Gaia, while the 2014 Challenge Cup winners H 65 Höör HK meet HC Vardar SCJS from FYR Macedonia. Two-time Cup Winners' Cup finalists from Lokomotiva will play against Ardesen GSK from Turkey. First leg matches of the Last 16 will be played 4-5 February 2017, the reverse fixtures will follow one week later.